1. There will be a General Election in 2009, most probably in the autumn. The Liberal Demorats will slightly increase their number of MPs, holding on to all four of their Welsh seats. Gordon Brown will emerge from the election with a single figure majority - OK, that was wrong. I no longer believe that Gordon Brown will hold onto power but I am sticking to my predictions for the performance of the Liberal Democrats in Wales. 2. The Swans will finish comfortably in the top half of the Championship but will miss the play-offs - a hit but scant consolation in that. I am hoping for a play-off place this year. Swansea to beat Cardiff in the play-off final would make many people happy around here but if David Jones' team are to make that stage they will need to stop throwing away four goal leads. 3. Rhodri Morgan will resign as Welsh Labour Leader on schedule and will be succeeded by Carwyn Jones - bang on the button. 4. Nick Bourne will survive the year as Welsh Conservative Leader - again a hit despite the best efforts of some in his group. 6. I will seek to lose weight and fail miserably once more - these predictions are just too easy. 7. Vaughan Roderick will write something nice about the Welsh Liberal Democrats on his blog - actually I am sure that he did, it is just that I cannot find it at the moment. So, we will take that as a hit. 8. The Labour-Plaid Cymru One Wales coalition will survive a major crisis over the Welsh Language LCO and limp on throughout the year - another hit, though it seems that the biggest wobble was over the referendum date. 9. The Ospreys will win the Magners League and the EDF Cup - no more sporting predictions. I just don't get it do I? In all I make that six out of nine. It really is best to quit while I am ahead. And just to prove that we are leaving 2009 on a low, the BBC report that the controversy over Police holding the DNA of innocent people looks set to rumble on into the new year. In fact, even civil liberty breaches appear to be subject to a postcode lottery these days. They say that some forces delete the profiles of most of those innocent applicants who ask, but others refuse to remove any at all. The average removal rate is only 22%, with six forces not removing any. The forces that did not remove the DNA profiles of any applicants were Nottingham, Dyfed Powys, Cambridgeshire, City of London, Humberside and Gloucestershire. Those most likely to remove the information were South Yorkshire and Wiltshire, with 80% or more of requests granted. Last year the European Court of Human Rights ruled that the DNA records of people who had not been charged or convicted cannot be held indefinitely however the Government's response was wholly inadequate and fell far short of the Scottish system where most profiles are deleted if there has been no charge or conviction. It has now become evident that the Government cannot even get agreement amongst the various police forces to take a consistent approach to their flawed guidelines. After yesterday's leak of the Prime Minister's New Year message in which he declared that the recession is over, that unemployment will start falling within a year and promised that a “decade of shared prosperity” lies ahead it is interesting to note from today's Guardian how big a hole he has dug for us. It is not a pretty picture. These facts will make it even more difficult for Labour to portray itself as a party of economic competence over the next four months, in the lead up to the General Election. On her best Christmas celebrations ever, Paris says "I’ve had a lot of great Christmases, but last year’s one was pretty amazing. I had a huge party at my house, and the front and back yards were covered with real snow I had shipped in. We built a mini-mountain in the garden so we could go sledding; it was really festive and so much fun." I suppose we could now have a debate as to whether more CO2 is expended shipping the snow in or jetting off to an area where it occurs natuarally. Gordon Brown's New Year message is apparently going to set an optimisic tone. According to The Times, the Prime Minister will declare that the recession is over, that unemployment will start falling within a year and promise that a “decade of shared prosperity” lies ahead. If all it took was his say-so then why didn't he do it earlier? Often in politics the fact that somebody or some organisation is 'under investigation' is taken as a sign of guilt, that is of course not the case. However, the outcome of this particular inquiry will be watched with interest. While the eye-grabbing headline is asking for a “Twitter Genius” in Greenwich Village, the actual role is an “expert” social media marketer for some sort of e-commerce startup. “I need someone who tweets in their sleep and updates their fb status before calling their mom on Mother’s Day,” the description reads. And it gets better. 1) Email me two tweets. The first should be about your experience. The second should by why you’re perfect for this job. If you exceed twitter’s allotted character count, you’re done. 3) Tell me how many followers you have and how many people you follow. 4) Tell me who’s the best person you follow and why (in tweet form). 5) Tell me what’s the best way to get more followers (in tweet form). So basically, if this application is more than 600 characters or so, you’re done. And you better be damn well ready to talk briefly about how you can best self-promote, or you’re done. Also, it’s probably better if you don’t want too much money. But don’t say why, keep it short. I suppose it will ensure that they can keep staff meetings short. Will the interview be conducted in 140 character chunks as well? Last month Harriet Harman told the Commons that from the new year the allowance, a fund for sitting MPs to publicise their constituency work through leaflets and websites, would be scrapped. Limits on spending by political parties come into force on January 1, until the general election. Public money for political purposes is more tightly controlled during this period. “The proposal is that the use of the communications allowance should end on December 31, after which the new election expenses limits will come into force,” Ms Harman, the Leader of the House, said. Now, after pressure from furious MPs the House of Commons Commission, whose membership includes the Speaker, Ms Harman and Sir George Young, a member of the Shadow Cabinet, have agreed to continue to make the fund available, according to minutes. The scope of what can be covered by claims will be restricted from January 1. Personally, I have never liked this allowance. It effectively uses public money to reinforce incumbency. The fact that it will be available to be used in the run-up to a General Election will give sitting MPs an unfair advantage. This decision is not a surprise but the wider signal that it sends out needs to be noted. The fact that this u-turn has happened at all indicates that the House of Commons is not serious about reforming its allowances system. There are too many vested interests and the will does not appear to be there to overcome them. If that is the case then it will be a sad day indeed for democracy in this country. David Cameron has been at it again, claiming that differences between Conservatives and Liberal Democrats are now "a lot less than in the past". He said: "Let's be honest that whether you're Labour, Conservative or Liberal Democrat, you're motivated by pretty much the same progressive aims: a country that is safer, fairer, greener and where opportunity is more equal. It's how to achieve these aims that we disagree about and indeed between the Conservatives and the Liberal Democrats there is a lot less disagreement than there used to be." For me one of the chief differences between the Liberal Democrats and the Tories is that we want take 4 million people on low incomes out of income tax altogether, whereas the Tories are proposing to raise the inheritance tax threshold to £2 million, saving 18 millionaire members of the shadow cabinet up to £520,000 each as well as benefiting many other wealthy people. That shows that we understand what fairness means, whilst the Tories do not. We are also committed to individual liberties and human rights, an agenda the Tories only pay lip service to as is evidenced in their proposals to ban extremists from broadcasting their views and engaging in protests. However for anybody who is still confused here is a video that demonstrates the difference vividly. It is of a key Conservative candidate who reflects the views of many in his party that he is a member of the ruling class with a God-given right to be in Government and that as far as he is concerned the rest of us are just potted plants. The Daily Telegraph reports on the astonishing case of the 86 year old Indian State Governor who has resigned after a video emerged apparently showing him in bed with three young women. They say that N D Tiwari, 86, a member of the ruling Congress Party and the senior representative in Andhra Pradesh state, quit after a television channel aired the compromising footage. He said the footage was doctored, but an embarrassed Congress party asked the governor to resign. He did so, on health grounds. If the video turns out to be genuine then there doesn't seem to be that much wrong with his health. Once you have accepted the principle that education is no longer going to be free, then you have turned a place of learning into a marketplace. Then it is just a matter of setting the price and the consquence of that is a bidding war. Hence in this morning's Observer we have David "Danny" Blanchflower, a former member of the Bank of England's monetary policy committee calling for students from well-off families to be charged the "market rate" of up to £30,000 a year to go to university. He believes that universities should be able to charge the richest students large fees while providing financial aid to the less well off. In this instance the target of his ire are familes who already opt out of the system by paying huge sums of money to send their kids to private school. Is this a natural extension of Gordon Brown's class war? The fact is that even with such large sums of money at their disposal university bursary schemes often miss their target and poorer students remain deterred from higher education by the debts they will accrue during their studies. Professor Blanchflower uses as an example Dartmouth College in New Hampshire, an American university that is a member of the Ivy League, where he teaches. He says half the students there receive financial aid. However, most of those students still need to do jobs to pay their way, undermining their studies. Moreover, if we were to adopt this system we would be in danger of creating colleges that are effectively full of haves and have-nots, in which those whose parents cough up the full tariff for their education might expect gold star treatment. Professor Blanchflower earned a B.A. in Social Sciences (Economics) at the University of Leicester in 1973 and a Postgraduate Certificate in Education at the University of Birmingham in 1975. He received an M.Sc. (Economics) at the University of Wales in 1981 and his Ph.D. in 1985 at Queen Mary, University of London. Do we think that he paid his own tuition fees for his undergraduate degree? No, of course he didn't. Perhaps he would like to make amends by sending a cheque for £90,000 to the Chancellor of the Exchequer straight away. I am sure we can negotiate the price for all those postgraduate qualifications later. Today's Times contains the news that the Labour Government's celebrations of the NHS's 60th birthday cost a little bit more than they should have done thanks to the change in the logo that accompanied the event. I think that it is reasonable to argue anyway that, whatever the merits of the anniversary celebrations they were designed as a party political event with the sole objective of promoting Labour as the party of the health service. This completely ignores the fact that the concept of the Health Service was thought up by a Liberal Party member, even if it was implemented by a Labour Minister, who later resigned due to a change in policy direction by his own party, when they introduced prescription charges for dental care and spectacles in 1951. In this context another £12,000 on top of the bill taxpayers have already incurred for this party political propaganda seems small, but the principle is important as are the choices Ministers make as to how to spend our money. Once again the Government seems to have had the wool pulled over their eyes by marketers. Spending revealed under the Freedom of Information (FoI) Act includes £153,522 on branding and logos to launch FERA, an agency that inspects plants and bees, and a £21,090 rebrand that changed the colours of the HomeBuy programme’s logo only months before one of its key schemes ran out of money. Many departments refused to respond to FoI requests for branding and logo design costs over the past five years or withheld details relating to subsidiary agencies. But even with full disclosure from only three departments, the bill is more than £1 million, a fraction of the true total. Thousands more were spent on printing updated stationery. In the current economic climate, minding the pennies becomes more and more important. That is a lesson that Government Ministers and their top civil servants need to learn when authorising these rebranding exercises. Maybe next time they will follow the example of the Ministry of Defence and do it in-house. As they have done on-line for the last 12 years Norad are traking Santa's progress across the globe here. At time of posting he is on Christmas Island. Here he is passing through Sydney, Australia. I blogged on the history of this tracking endeavour last year. Update: you can track Santa on Twitter too. The Guardian reports that David Cameron is facing pressure to explain whether the Conservatives have complied with the spirit of electoral law after the party accepted £100,000 from the British wing of a company controlled by a multibillionaire Lebanese former arms dealer. The Tories said the donations were legal. A spokesman said: "Our compliance unit applies two strict tests to all company donations in accordance with Electoral Commission guidance. They are: is the company UK-registered and is the company carrying on business in the UK? These donations met those tests and were therefore legal and permissible." Of course all parties have gone through this sort of controversy and will continue to do so whilst the rules on donations remains as they do. The fact is that many donors believe that they can buy influence and whilst parties rely on them for funds then they will continue to operate in that belief. The state funding of political parties may not be popular but at least it would reduce the reliance on donors considered to be involved in unethical activities and bring greater transparency to the political process. David Williams, Chairman of the Badger Trust, said: “It is with some reluctance but nevertheless firm resolve that we must, as an organisation dedicated to the welfare and protection of the badger, enter into these proceedings at the highest level. The decision is unjust and goes against the scientific evidence, and the law affords us this opportunity of challenging the legality of the W.A.G.’s intention to kill badgers, and we are now taking it”. Although Peter Mandelson's decision to slash University teaching budgets by millions of pounds only applies to England it is likely to have an impact on Wales by reducing the amount of money we receive through the Barnett formula. Colleges over the border will now lose £135 million on top of £180 million in savings they alteady have to find over the next 18 months. In addition a review of tuition fees began last month and will conclude after the general election. It is expected to recommend that they be raised considerably from the current £3,225 a year. That will certainly lead to pressure on the Welsh Government to follow suit, especially now that Plaid Cymru have abandoned their principles and agreed to introduce top-up fess in Wales. The decision is especially bizarre during a time of recession as surely we should be investing in education and training not cutting it. This is an argument that we have made in the Assembly where Labour and Plaid Cymru have imposed real term cuts of 5% in further and higher education. One thing is certain, the days of rapid expansion of higher education and targets of getting 50% of all A-level students into a University are behind us. It is that policy that has driven the tuition fee agenda. There clearly needs to be a major rethink on admission targets and the strategic future of the HE sector. That should go hand in hand with the principle of free access to education and training as an essential investment in the future of this country. This blog post from Matt Withers has to be the story of the day and is worth reproducing in full. That is twice in one week I have been nice about Matt. It must be Christmas. I phoned Conservative Central Office this morning to seek a reaction to this interview, in today's Daily Mirror, in which Doctor Who writer Russell T Davies warns the BBC will be dismantled by the party if they get into power next year. They wouldn't comment on it, I was told, because "Mr Davies is a backbench MP and, as such, his opinion isn't necessarily party policy". Hmm. You are aware Russell T Davies is the writer behind Doctor Who, and not actually one of your MPs? "Give me your e-mail address and I'll get back to you." Do you think that Tory Party Central Office thought that they were being asked about David TC Davies, the MP for Monmouthshire? Having spent an interested morning yesterday at Swansea Council's Neighbourhood Support Unit and freaking out my work experience student at how detailed the CCTV coverage of Wind Street is, I called in this morning to meet doctors and nurses at Morriston Hospital's Accident and Emergency Department. Despite it being early in the day the department was still very busy. Obviously the snow has taken its toll but so has the fact that Morriston Hospital is running at 95% to 100% occupancy on its acute beds and some wards are closed to admissions in Singleton due to a novovirus outbreak. This means that a few patients spent all night in the trolley bays awaiting admission, whilst the staff's ability to admit people quickly and make room for new patients is limited. As a result breaches of the four hour target time are common. This is not a criticism of the staff. As ever they are dedicated and hard-working but with some on long term sick and with agency and bank workers not always available the unit is under-resourced. Indeed I was told that the department's budget only allows a 4% leeway for sickness. In my experience 15% is more normal to ensure full coverage. Together with the shortage of acute beds this leads to bottlenecks, with ambulances not always able to handover patients promptly and with trolley bays being unavailable for new patients. All of those I spoke to said that alcohol was a problem with between one fifth and half of all patients presenting themselves at A&E being under the influence. Verbal abuse is a daily occurrence though violence less so but the Health Board operates a zero tolerance policy towards all such incidents. All agreed that CCTV in the unit would be an advantage. Unfortunately, Morriston was not included in the recent pilot scheme announced by the Minister. Of some concern was the position of the paediatric accident and emergency unit. Ideally this should be open 24 hours but there are not enough staff to ensure this happens. Instead it is open 9am to 9pm. Outside those hours children attend the normal accident and emergency department, which is not good practice. I was shocked when I was told that although the staff have access to the child protection register and the list of looked-after children this only applies to the Swansea Council area. This is despite the fact that Swansea is a tourist area and that as a matter of routine Morriston receives patients from Llanelli, Neath Port Talbot and further afield. This is the case with all accident and emergency units so it is possible for someone to bring a child to a different hospital after each incident without staff having access to the necessary information to establish a pattern. It is far easier to flag up concerns and to follow them through if staff have access to these registers. It seems to me that there is a case for an all-Wales register of vulnerable and looked after children that can be accessed at Accident and Emergency Departments, which are often not restricted to local authority boundaries in the patients they see. Such a register could improve the way that health professionals respond to incidents and save lives. It has taken many months to get the information from the Welsh Assembly Government but at last the Western Mail has been successful. They quite rightly point out that although the number of local health boards shrank from 22 to seven and dozens of highly-paid top management posts disappeared, no-one was invited to apply for voluntary redundancy or otherwise forced to take it. Despite questions in the Health Committee and Plenary all we have been able to get from the Minister on this is vague statements about her not being in favour of redundancies and that Health Boards are working out their new organisational structures. That may be true but it does not give us any comfort about the level of forethought and planning that has gone into this organisation and its outcome. What seems to have come from it is more organisational instability and the diversion of more resources from front-line services. A breakdown shows that the 56 executives without new roles include five chief executives, nine medical directors, 12 nurse directors, 14 finance directors as well as 16 “other” directors. The salary ranges and averages of the displaced executives include LHB chief executive salaries of £71,000-£81,000, with an average salary of £78,000. A trust nurse director’s average salary is £104,000; an LHB nurse director’s pay ranges from £52,000-£81,000, with an average salary of £64,000. An LHB finance director’s salary ranges from £64,000-£86,000, with an average salary of £75,000, while a trust finance director’s ranges from £81,000-£120,000, with an average of £93,000. Other LHB directors’ salaries range from £53,000-£86,000 with an average of £63,000; other trust directors’ salaries range from £74,000-£110,000, with an average salary of £92,000. No trust chief executives remain displaced. Our conservative estimate of the cost of employing the displaced executives is £3.7m on an annual basis. This is quite a contrast to a recent Health, Wellbeing and Local Government Committee where I questioned the Minister as to why a consultation revealed by an FOI in June showed that the government anticipated spending £13.5 million on post re-organisation redundancies for senior staff, despite the Minister having promised a no-redundancy policy. The Minister seemed unable to answer any questions as to how much was being spent on employing former Senior Managers at their prior salaries, as well as how much would be saved as a result of the re-organisation that was completed in October this year. I have been quite clear in my interventions on this matter that although I do not want to see people lose their jobs, it is an inevitable part of reorganisations of this sort. Senior staff should not be paid to do unnecessary jobs. Money saved should be invested back into frontline services. That is how the re-organisation was sold to us and that is the direction it should have taken. The Conservative-linked Taxpayers' Alliance, which campaigns against the misuse of public funds, has set up a charity under a different name which can secure subsidies from the taxman worth up to 40% on individuals' donations. In one example, Midlands businessmen said they channelled funds through the Politics and Economics Research Trust at the request of the Taxpayers' Alliance after they asked the campaign group to undertake research into policies which stood to damage their business interests. The arrangement allowed the Taxpayers' Alliance to benefit from Gift Aid on the donations, a spokesman for the donors said. State funding of political parties was never likely to find popular favour: the row over MPs’ expenses has put paid to it for at least a generation. But the democratic party political system – policy development and campaigning – has to be paid for somehow. I believe government has a role to play in encouraging more citizens to get involved in our democracy, and that includes encouraging all of us to help pay for the party political work which underpins it. Better, in my view, that citizens be able voluntarily to show their financial support for political causes, than for it to be made compulsory through state funding. Stephen Tall's point is worth making and yes, the Guardian is being tribal, but the fact is that this story is worth noting purely for the irony involved. With one of their director's, Alexander Heath living in a farmhouse in the Loire without having paid British tax for many years as well, it is difficult to take this organisation seriously, if indeed we ever did. If the Observer's report that the names of nearly a million people who have not been convicted or cautioned for any crime will continue to be stored on the police national computer, even though the government is changing the law so that their DNA profiles are deleted is true then it is a disgrace. The paper says that the government has been forced to scale back the way it holds the details of people held on the national DNA database, following a European Court ruling that retaining the profiles of people arrested but not charged with a crime or who were acquitted, was "disproportionate". As a result, government plans – outlined in the crime and security bill going through parliament – will limit how long the DNA profiles of such people can be kept. In most cases it will be up to six years. But the Observer has established that the records of their arrest will be held by police for an indefinite period. The 2005 National DNA Database Annual Report says: "It has become necessary to retain a nominal record of every person arrested for a recordable offence on the Police National Computer… to help the police identify and locate an individual following a match being obtained on the [DNA database]." Prior to the expansion of the DNA database, details were deleted on acquittal or if charges were dropped after 42 days. This has produced concerns from the office of the information commissioner that the very existence of a police identity record created as a result of a DNA sample being taken on arrest could prejudice the interests of the individual to whom it relates by creating inaccurate assumptions about his or her criminal past. "The way in which permanent DNA retention leads to indefinite arrest records demonstrates the self-justification of the database state," said Isabella Sankey, policy director of campaign group Liberty. "Government has fed a culture where arrest might as well be conviction, and suspicion equals guilt. In this climate, a permanent record of suspicion can seriously damage the life chances of any young person who has ever had their collar felt by the police." She is right. The government needs to rethink its approach to this issue. Meanwhile over in the Observer, Mr. Blair's biographer is more critical. The man who once described Blair as a "political colossus" with achievements as least as great as Margaret Thatcher's, has warned that his reputation will be destroyed if he refuses to apologise for his errors over the Iraq war. Anthony Seldon says Blair possessed a rare gift for understanding the public mood and an ability to speak in a way "that touched the British psyche better than any prime minster since Winston Churchill". But he argues that he "lost it" when he turned from a populist to a conviction politician, driven by his Christian beliefs and a sense of moral purpose that made him sure he was always right. All of this activity of course is just a prelude to the former Prime Minister's appearance before the Chilcot inquiry into the Iraq war in the new year, when critics hope he will face charges of manipulating intelligence. Ken Macdonald, QC, the former director of public prosecutions, accused him last week of “deceit” and “subterfuge”, but Blair said the critics were “doing it more for effect than anything else”. Seldon argues that the appearance will be the final chance to admit his mistakes. "Where Blair should accept responsibility is for misleading the British public over the reason for committing British troops to fight," Seldon writes. "While the intelligence was sufficient to convince most insiders across the world that Saddam had powerful weapons, Blair could and should have probed the '45 minutes' thesis more on WMDs, and given far greater weight to the moral case for war over WMDs. If this had failed to sway parliament, then he should have accepted that verdict." Blair should also apologise, he adds, for failing to extract further concessions from the US and – the gravest error – for lack of postwar planning. Seldon remains in awe of Blair's record, but warns: "The war and its aftermath continue to stalk him and diminish everything else he achieved. The moral certainty he displays is one side of Christianity; the other is humility. The more we hear of the latter, the quicker the scar of Iraq on his own and on Britain's reputation will begin to heal." The Daily Telegraph reports that in some parts of the country there is a camera for almost every 100 people after the Government and local councils spent hundreds of millions of pounds to treble their numbers in the last decade. They say that Town halls now control around 60,000 cameras, which are used by the authorities and police to spy on the public and investigate crimes – compared to just 21,000 in 1999. Alex Deane, the director of Big Brother Watch, said CCTV was seen as a "cheap alternative to policing" and the rise of expensive "surveillance networks" has made little impact on cutting crime. He said: "Local councils across Britain are creating enormous networks of CCTV surveillance at great expense, but the evidence for the ability of CCTV to deter or solve crimes is sketchy at best. CCTV has its place if it is of sufficient quality, supports effective community policing and proper safeguards against their misuse are put in place. Those who misinterpreted Nick Cleggs remarks about the affordability of the Liberal Democrats' policy to abolish tuition fees as an abandonment of that commitment must be sorely disappointed. For the party has reaffirmed its policy today and has put forward costings so that it can be included in our General Election manifesto. In the briefing send out by Party headquarters the justification for the policy is made clear. They say that university is getting more and more expensive. To get a degree, young people are saddled with thousands of pounds of debt when it is tough enough to get a job, get on the housing ladder and make ends meet. The Liberal Democrats are the only party which believes university education should be free and everyone who has the ability should be able to study at university and not be put off by the cost. We will scrap tuition fees for all students taking their first degrees saving them over £10,000 each. We have a financially responsible plan to phase fees out over six years, so that the change is affordable in these difficult economic times. While fees for full-time HE students are now repayable as part of the loan scheme, they still represent a significant burden on students. Taking maintenance loans and fee loans together, many students will be starting their working lives with a debt of over £20,000. This will create serious problems for people at the age when they want to settle down, start families and get on the property ladder. Scrapping fees would greatly reduce that level of debt. We also know that people from low income families are more risk averse when it comes to getting into debt, and so fees are a barrier to widening the social basis of participation in HE. Liberal Democrats do not in any case believe the state should be encouraging people to get into a lifetime of debt. The party says that it will pay for this commitment by cuts elsewhere in Government. This will include changes like abolishing the government Offices of the Regions (£340m), scrapping the Intercept Modernisation Programme (£200m) and scaling back Homebuy (£260m), prison reform (£560m) and reform of UK Trade and Investments (£60m). Full costings for all our manifesto proposals will be published at the time of the General Election. This is one of a very few major spending commitments that the Liberal Democrats will be proposing in our manifesto. We can afford to do this because we have gone further than any other party in setting out credible plans to tackle the deficit. They go on: Nick Clegg has always been absolutely clear he opposes tuition fees and wants to scrap them. At the Party Conference he said he would only commit the party to it if it was affordable. This is a plan that makes it affordable - it defers a substantial amount of the cost until the economy and the public finances are in a better state, but it remains a clear plan to scrap fees for good. It has always been the case of course that whatever Nick Clegg and the party in England decide to do it is up to the party in Wales and Scotland as to what our policy is going to be in the devolved administrations. Today's announcement will apply to Welsh and Scottish students studying in England as well as English students crossing the border. What this does is offer an opportunity to the Welsh Liberal Democrats to press the case in Wales. While Labour and the Tories collude, with the support of Plaid Cymru to get fees off the agenda until after the General Election, the Liberal Democrats are the only party offering students the free education they deserve. Whether full powers over tuition fees are in the hands of the Assembly by then or not, the huge amounts of money that this policy would bring to Wales, either through Barnet, or through a reformed funding system will mean that Labour and Plaid will have no further excuses not to reverse their betrayal of Welsh students. Does it matter that government officials cannot speak Welsh? This morning's Western Mail carries figures released to Cymdeithas yr Iaith Gymraeg which show that just 317 of the 2,688 or 12% of the civil servants working in the body’s headquarters at Cathays Park, Cardiff, can speak Welsh. Out of the Assembly Government’s entire workforce of 6,513, only 203 (3.1%) are Welsh learners – down from 7.3% in 2003. This is despite the fact that the 2001 census recorded that more than one-in-five people living in Wales could speak Welsh, with more recent surveys suggesting it is now closer to 25%. According to the Menna Machreth Jones, who chairs the Welsh Language Society these figures are disappointing. She says that "There are a few positive initiatives the Assembly Government is taking to promote the Welsh language, but they are clearly not enough. “As the Equality and Human Rights Commission pointed out earlier this year, women are also under-represented at the top levels of power. There’s clearly a wider equalities problem. “I hope the Assembly Government will agree to do something about the issue. At the moment, they’re treating Welsh like an optional add-on rather than as an essential part of the Government’s work." The comparison with the wider equalities agenda is instructive but I am not so sure about the interpretation of what a bilingual society means. The paper is certainly right that these figures seem to demolish the myth that you need to be able to speak Welsh to get a job, but surely the requirement should be that civil servants should understand the bilingual context in which policy is formulated rather than be able to actually speak the language themselves. Just as it is not essential that the First Minister speaks Welsh so it should not be compulsory that we achieve a welsh speaking majority amongst those who service the Welsh Government. As the Government spokesperson makes clear, where bilingualism is essential then it is insisted on. There are a whole raft of policies that support the Welsh language in the running of the government and opportunities are available for staff to learn if they wish. In fact 41% of Welsh Government staff have some level of Welsh language skills, ranging from basic to fluent. Unfortunately, all the Welsh Language Society are doing with this sort of publicity is undermining their own cause and just when we were starting too make substantial progress as well. 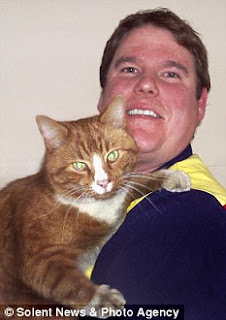 The Daily Mail carries the story of Sandi, a ginger tom who went out for a stroll one night and ended up travelling 1,400 miles to Spain and back. For the return journey he was fed a special menu of salmon, chicken and milk and had an ensuite cabin with sea view, which usually costs up to £266. Crew members paid hourly visits to his room during the 36 hour sailing to give him a stroke and to ensure he remained comfortable. They gave him his own pillow and donated one of their warm jackets. And the ship's captain, Alastair McFadyen, even found time to visit the stowaway. In the old days they would have made the cat walk the plank. Tory candidate Zac Goldsmith has been accused of seeking to 'buy a seat in Parliament as if he were punting on a roulette wheel' today after it was revealed that he has spent more than a quarter of a million pounds of his own money on getting elected. According to the Electoral Commission, Mr. Goldsmith has donated £260,000 to his local Tory Association since he was selected to fight the Richmond Park seat in 2007. Virtually all of the money goes to office staff and “office costs”. The party says that Mr Goldsmith set up his own office in Richmond, separate to the local association's headquarters. The candidate employs two members of staff to help him campaign. This latest controversy comes shortly after calculations by Liberal Democrat Home Affairs Spokesperson, Chris Huhne that Goldsmith's status as a non Dom means that he has managed to avoid paying around £580,000 a year in UK taxes over the past decade. Having spent over 25 years as an elected representative I am well aware of the problems of driving through efficiency initiatives in the public sector. The problem is that unless you are very careful and keep on top of it constantly, the bureaucracy expands to fill any available space. Thus if you save money in one area, before you know it that cash is being eaten up elsewhere and in most cases it is not on anything productive. The Government appears to have run headlong into this phenomenon if this article in yesterday's Independent is any guide. They report that a previous Whitehall "efficiency drive" led to more civil servants and bigger departmental budgets. They say that this casts doubt on the Prime Minister's latest initiative in which he pledged to reduce Britain's £800bn national debt with a package that he believes will save £12bn over four years. The package, unveiled two days before Alistair Darling's pre-Budget report, includes plans to "name and shame" overpaid public sector workers and use crime maps and online school reports to cut overheads and halve the budget deficit. Although ministers claim success in hitting Gershon-inspired targets, an analysis of 17 of the 21 departments shows the payroll has risen from 525,000 to almost 540,000 since 2004; budgets have soared from £143bn to £180bn; and staffing numbers conflict dramatically with government figures, which put the civil servant headcount at about 496,000. Details tucked away in the latest annual reports and accounts reveal that seven departments admit increasing staff levels. But even those that maintain they have cut numbers have been accused of merely shifting staff to other departments or into a growing number of semi-autonomous quangos, which are still funded by taxpayers' money. They point to a book called 'Fleeced' by David Craig and Matthew Elliott, which traces some £3,000bn of public funds they believe have been mismanaged in the past decade. They claim the Cabinet Office "cut" 958 jobs in three years by transferring hundreds of staff to berths elsewhere in government. There is a very lengthy letter in this morning's Western Mail from a member of the Joint Committee for Ethnic Minorities in Wales decrying the defection of Mohammed Ashgar from Plaid Cymru to the Tories. To describe him as unprincipled in the absence of any credible evidence by the chief executive of AWMEA is both irrational and unhelpful. However, the explanation provided so far by Mohammad Asghar for his action is unsatisfactory. He contested the last election on a Plaid Cymru manifesto which set out in both historical and contemporary terms the objectives of the party including its future agenda for the WAG. Some newspapers have reported the preparation of a putsch which would result in the removal of Mohammad Asghar and his replacement by Mr Adam Price MP. Both Mr Asghar and Plaid Cymru should publicly confirm or deny the authenticity of this story for a proper appraisal of the action of Mr Asghar, particularly in the light of your report that neither the leadership of Plaid in the Assembly nor his personal staff at the Assembly were aware of his intention to defect to the Conservatives. He owes the whole of Wales an explanation – rational and intelligible – for his cataclysmic decision to disturb the political equilibrium of an Assembly which may soon be involved in a referendum the result of which would determine the economic, political and social life in Wales for many years to come. Whereas I would not argue with the thrust of the letter that an explanation should be forthcoming I cannot get a nagging doubt out of my mind about some of the reaction to this defection. That doubt can be summed up in one question: why should an ethnic minority politician be expected to act differently or to have different standards to any other politician? Chris Huhne has told the Observer that in his estimation, Zac Goldsmith's non-domiciled tax status has cost the British taxpayer nearly £6 million over the last ten years. This is despite that fact that he is estimated to have a personal fortune of at least £200m, inherited from his late father, Sir James Goldsmith. Huhne said last night that anyone wanting to become an MP should be fully transparent about tax affairs. "Someone who wants to pass laws about tax in this country ought to pay this country's full taxes, and not hide behind the special offshore status of non-doms. "Zac Goldsmith, even on the most conservative estimates, has avoided vast amounts of British tax by deploying the non-dom tax dodge. If he challenges our estimate of how much tax he has dodged, then I put to him a simple challenge. Publish your tax returns for the past 10 years, and I will publish mine." An analysis by the Observer of donations given to the party shows that six companies and individuals who profit from the oil and gas industries have begun to give it money over the past year. In the current quarter, it received a £50,000 donation from "Future Pipe Industries". This firm, registered in Britain, is "headquartered in Dubai" and by headed by a UAE resident, Rami Makhzoumi. He told one newspaper: "In recent years the oil and gas market has been our fastest growing end-market due to the overall level of investment in the sector globally, and especially, in the regions in which we operate." Majid Jafar, 33, who is from the United Arab Emirates, has given £40,000 to the party over the past year. He is the executive director of a family oil firm, Crescent Petroleum Group, and a member of the board of directors of Dana Gas PJSC. He is also a director of Gulftainer. He previously worked for Shell International in its exploration and production and gas and power divisions. The party has also received £55,000 in the last year from John Dodd, a founder member of Artemis Capital. More than a third of Artemis's "Alpha fund" is invested in oil and gas. David Cameron's 'blue is green' campaign looks quite shallow in the light of those figures. The BBC have a good example this morning of what happens when a government tries too hard to spin what seems to be a good news story plucked from adversity to its own advantage and overreaches itself in the process. They reveal that the pre-Budget report pledge to raise the state pension will not apply to some parts of the pension - potentially saving the Treasury £350m in 2010/11 despite the fact that on Wednesday, Chancellor Alistair Darling said the "basic state pension" would rise by 2.5% in April. The pensions minister has admitted that the rise will not apply to extras such as the state earnings related pension (Serps). Angela Eagle says this will prevent "confusion and unfairness" because Serps affects company pension payments. But the BBC's Money Box programme has learned that the freeze will extend to other parts of the state pension which do not affect company payments at all. The Department for Work and Pensions has confirmed that the small earnings-related supplement called graduated pension, which is paid to more than 10 million people, will also be kept at this year's level. It is likely that the additional pension of £57.05 paid to 41,000 men who have wives under 60 will not rise either. The BBC say that also under threat is the increase in the extra pension of £7 a week paid to 1.2 million over 60s who have delayed their retirement. That could also be included in the freeze policy when details are revealed on Monday. The outcome therefore is that millions of pensioners will not get the 2.5% uplift which they may believe that they were promised and are expecting. It will not go down well just before a General Election. Rhodri Glyn Thomas: I, too, would like to echo the thanks for your contribution over the last decade and wish you well for the future both in the Assembly and, after that, in your retirement. Your contribution has been exceptionally important over the 10 years of devolution. As the most well-known figure in Welsh politics, will you make a commitment to play a prominent role in the referendum that will be held during the next year on the next step of devolution? Many of us think that your contribution would be extremely important in this referendum. The First Minister: Thank you very much for your kind words. I was thinking of you last night when I was faced with the huge burden of opening the envelope and reading out the names of the three winners of the Welsh sports personality of the year competition. I was thinking 'I do not want to do the same thing as Rhodri Glyn’. Fortunately, the names had been written out very simply so that no-one could make any mistake in reading out the names of the winners in the correct order. Fair play, things never get this heated in the Welsh Assembly. I will be surprised if this survives on You Tube for long. The Green Party's Paul Gogarty has released a torrent of abuse at Labour's Emmet Stagg during a Dail Budget debate. Stagg and the Green TD had been exchanging verbal blows in the chamber. But nothing prepared Stagg for the outburst. Gogarty later apologised for his language claiming it was patriotism that had fired him. WARNING: The Video attached is uncut and uncensored. It contains swearing and aggressive behaviour. Just over a week ago I had a go at guessing who might end up in Carwyn Jones' cabinet. Some I got wrong but by and large I was not far off the mark. The two significant differences were over Jane Hutt and Huw Lewis. I was of the view that Jane Hutt would be dropped. She has not been a huge success in either of the two portfolios she has held of health and education, amongst other instances presiding over a huge rise in waiting times in the first administration and failing to fund the Foundation Phase properly whilst in charge of education. Nevertheless, her appointment as Minister for Finance and Assembly Business is a shrewd move. It plays to her strength, which is as a conciliator, a negotiator and a deal-maker. She proved that when she was last Business Minister and those qualities too will hold her in good stead in putting together some of the most difficult budgets the Assembly will ever have faced. Huw Lewis is another matter. As Deputy Minster for Children he will at last have the opportunity to put into effect what he has been preaching for years. He may not have polled well enough in the leadership election to have guaranteed himself a cabinet place but I believe that it was a mistake not to have offered it to him. As I said in my previous post I thought Huw should have been given the Social Justice and Local Government post. Then he really could have shown what he could do. Still, Carl Sargeant should do well in that job, though I will be intrigued as to how he adapts to the local government side of his portfolio. As predicted Edwina Hart, Jane Davidson and Gwenda Thomas stay in post, whilst Leighton Andrews gets his reward for running Carwyn's campaign by inheriting Education and Lifelong Learning. I also suggested that Lesley Griffiths would be promoted and so it proved. She will be deputy to Ieuan Wyn Jones, though it is not yet clear what exactly the boundaries of her brief are. Again, as I suggested John Griffiths has been made Counsel General. This job was designed for a high powered lawyer though that is not to say it should not be filled by a solicitor like John. Nevertheless, this is the second time this post has been used for political reasons to increase the size of the cabinet beyond its statutory limit of nine by appointing an Assembly Member. One cannot help but feel that we are not getting value for money in the way envisaged by the Government of Wales Act 2006. Alun Davies was overlooked for promotion and yet he indicated a few days ago that he would be vacating the chair of the rural affairs sub-committee. My guess is that he will be rewarded for his support for Carwyn by inheriting the chair of Communities and Culture from the new Chief Whip, Janice Gregory. Amongst other things this committee is responsible for broadcasting, which has been a strong interest of Alun's in the Assembly. As to whether that prediction turns out to be true or not we will have to wait until January to see. Plaid Cymru staffers have hit back today at their former Assembly Member, Mohammed Ashgar, who defected to the Tories on Tuesday. Plaid Cymru, however, took a decision after the panel report was published to impose the recommendations on its own AMs immediately. A senior Plaid source said: “In September, Mohammad Asghar sought clarification from the Fees Office about whether he could employ his daughter. He was told he could. “But the Plaid group then reminded him of the party decision that no more family members should be taken on, and told him that employing his daughter was unacceptable. Another Plaid source said: “He didn’t like the fact that he had been stopped from employing his daughter. “He obviously idolises her, and it seems this was the last straw for him. “He was very disappointed earlier when Natasha only secured fourth position on the party list for the European Parliament election. This is a complete contrast to statements on Tuesday when senior Plaid Cymru figures told the media that there were no on-going disputes between the party and Oscar. Presumably they decided to tell all now as part of their fightback. This row will run and run. The former Labour councillor, who is now a local government consultant, said: “Cosi and Cooper Standard used to employ more than 2,000 workers between them on adjacent sites. “What did Maesteg get in terms of Government aid when they both closed last year? Nowt. “Corus in Teesside employs 1,700 workers. What will the area get from the UK Government when the steelworks closes? [Business Secretary] Lord Mandelson has just announced a £60m package. It puts anything the Assembly Government spends on combating unemployment completely in the shade. Who said big government doesn’t work? “I wonder what would have happened if the plant had been in Wales? The UK Government can provide £60m for 1,700 jobs and the Assembly Government provides £20m for the whole of Wales on youth unemployment." The Welsh Government responds by trotting out its usual answer abour ReAct and ProAct together with a list of other initiatives, none of which are targetted at Maesteg. However, they never answer the fundamental question of why Maesteg is not getting the sort of public sector investment as Teeside or even for that matter the former Burberry site in Rhondda. 'while all job losses are regrettable, as critics of independence point out, Wales is overdependent on public sector jobs. This over-dependence has been deliberately encouraged by successive British governments in order to buy votes. Gordon Brown has recently authorised the transfer of nuclear submarines from the south coast of England to Scotland for the precise reason of buying votes. Successive British governments have failed to encourage adequate levels of private investment with Wales being the poorest UK nation as an inevitable result. That is all very well of course if you do not work for one of those UK offices that will be thrown out of Wales by a future Nationalist government. Effectively, Mr. John has confirmed that yes, thousands of jobs will be lost through independence, that he would expect the English workers to be repatriated and that despite thinking we are too over-reliant on the public sector, a Welsh state will still need to employ thousands of people in the same way as at present. He does not though say how we will pay for it given that we could have a £10bn to £15bn structural deficit in our public finances. I wonder if this is also the official position of Plaid Cymru? Where shall we put the snipers? I also want to thank all the special advisers that I have had. The function of a special adviser is sometimes described as that of a spin doctor, but by and large, our special advisers have not been spin doctors but policy wonks out of the top drawer—professors of sociology, and suchlike. I will never forget one moment when Tony Blair was coming to address people in Wales, and making a major speech on Europe in the old library in central Cardiff. He was a little late in arriving, and so the person in charge of his security arrangements turned to me and asked to speak to my senior special adviser. I pointed to Mark Drakeford, a professor of sociology, who was wearing his usual sweater and pair of jeans, and after digesting the news that this was my senior special adviser, this chap went over to Mark and asked him, 'Where shall I position my team of rooftop snipers?’ I did not think that he had quite understood what a special adviser was. Nevertheless, I do not know whether you will ever be forgiven by the translator for the deputy premier of China. You may remember that, over dinner, the deputy premier was at pains to tell us that we were a country of 3 million, that China was a country of 3 billion, and that there was something of a difference in scale. However, you proceeded to tell him what the ambitions were for our wise nation, and you recounted several stories before you realised that the poor translator had to write it all down in Chinese characters and then try to translate it for the deputy premier. I do not think he will ever forgive you because he could not catch up with your stories. However, the people of Wales have forgiven you for all sorts of things, which shows a level of trust. That trust was very much part of the relationship that we enjoyed when I worked with you in Government. It is important in politics that no matter from which corner you come, when you say that you are going to do something, you execute it, you carry it out, and you trust the people who carry it forward with you. I am deeply grateful for that. Translation: MPs don't need more scrutiny, just better scrutiny. The government calls insistently for more innovation. But doing things in a new way will not necessarily lead to better outcomes. So, what do we mean by innovation? We share the thinking of, for example, the Work Foundation, which sees innovation not ‘as a set of discrete and singular moments of change’ but rather as ‘a culture or process in which drivers of change are embedded in and facilitated by the strategic outlook of the organisation’. To draw an analogy from nature, innovation may be thought of as the new season’s growth rather than a series of isolated bright ideas. Translation: Change is, like, a state of mind, you know? Translation: We know the building probably won’t catch fire, but it might, and you should prepare for it. Principle 7: IIF leaders see the world through multiple lenses, through the subjective domains of intentions, purposes, values and culture, and the objective domains of performance, measurement and results. Incident and Injury-Free leaders understand intuitively that these domains are not in conflict but rather, they are mutually supportive; they are each facets of the one real world we live and work in. Translation: Health and safety officers are special, special people. Principle 9: IIF is a journey, not a destination. Translation: Do not, under any circumstances, put this health and safety booklet at the bottom of a drawer and never read it again. In today's debate on the Welsh Government's budget the Welsh Liberal Democrats called for urgent Welsh Government action to rethink education funding in Wales. The debate took place in the context of a protest by National Union of Teachers' members against real-terms budget cuts for schools and the continued underfunding of schoolchildren in Wales, compared to England. A Child in Wales is still funded by nearly £500 less than a child in England. As a result, a 1,000 pupil school in Wales receives half a million pounds less funding than the same school in England. These large funding deficits leave Welsh schools unable to maintain adequate staffing, support and learning resources. We are more likely to fall behind further, than catch up with England at this rate. That is a contrast to when the Welsh Liberal Democrats left government in 2003, when funding per head was higher in Wales than in comparable English counties. The First Minister Elect has promised to ‘child-proof all Assembly Government policies’ but the crisis in Welsh education is here and it is now. Class sizes are already being forced upwards, curriculums already narrowed, after-school activities have ended and classroom support staff let go as a direct result of existing funding shortfalls. Today's budget slashes education spending but protects government administration budgets and ineffective use of Welsh NHS funding. The Welsh Liberal Democrats believe the government should act now to remove complex and unnecessary grant-funding structures and divert funds on a pupil needs basis, towards those that need the most support. Carwyn Jones says in his leadership manifesto: ‘The test for me is simple. We must be able to ensure we can look our children and our grandchildren in the eye when we make these decisions’ However, in agreeing the new Assembly budget today, Welsh Labour has failed that first test. The defection of Mohammed Ashgar AM from Plaid Cymru to the Tories was first announced on the Welsh Liberal Democrat blog Freedom Central, before the Conservatives had even had time to announce it to the press. Sharing a floor with the Tories has its advantages and marching the defector to the Tory leader's office in full view of everybody was a dead giveaway, especially when Shadow Secretary of State for Wales, Cheryl Gillan was also there. There was also the mysterious moving of offices last night after everybody had gone home. I am told that Mohammed Ashgar was once a member of New Labour and before that the Tories. However it was Plaid Cymru who offered him the opportunity to serve in the Welsh Assembly even though it was evident from day one that he was not at home in that party. Freedom Central has recorded most of the key events and some of the reactions but there is one more observation I should make. The defection means that the One Wales Government no longer have a two thirds majority in the chamber. This should not matter as of course the Welsh Liberal Democrats will support the motion for a referendum on full law making powers. However, they now need to rely on other parties if they wish to change standing orders. That is not a bad thing in itself and will hardly give Carwyn Jones any sleepless nights. There is no doubt that the Tories have received a boost as a result of this defection and Plaid Cymru suffered a demoralising blow. Already there is talk of putting Adam Price into the vacancy at the next Assembly election but of course this particular list seat is quite marginal and swung between Tories and Plaid in the past. If though we throw in the possibility of the Welsh Liberal Democrats winning Newport East and the Tories taking Newport West in 2011 then Plaid should be safe in retaining both their regional seats in South Wales East. If Labour holds on in these two seats then it may be between Mohammed Ashgar and Adam Price for the final list seat. Definitely one to watch out for. The Welsh Assembly Government has no information on the British Guild of Mole catchers. However there is information available on the Internet - http://www.guildofbritishmolecatchers.co.uk/. Mole Catching – refer to attached advisory leaflet WM03. Mole trap use – refer to attached advisory leaflet WM03. Spring traps – see attached The Spring Traps Approval Order 1995. The Welsh Assembly Government is currently seeking approval for the authorisation of seven new named traps: the Kania Trap 2500, the Solway Spring Trap Mk4, the Solway Spring Trap Mk6, the Nooski Trap, the DOC 150 (Department of Conservation, New Zealand), the DOC 200 and the DOC 250. Daily checking of mole traps – refer to attached advisory leaflet. Jeff Nicholls re mole catcher - the Welsh Assembly Government has no information on the Jeff Nicholls. However there is information available on the Internet – http://www.molecatcher.co.uk/. In 14 days time we will be commemorating the thirtieth anniversary of the publication of a Parliamentary Bill that was to become the Housing Act 1980, a piece of legislation that ushered in a social revolution. It was the start of the Right to Buy, which built on previous legislation in 1957 and has since enabled 2 million tenants to buy their own home. Today's Observer has a piece looking at the impact of this policy, that along with the Falklands War and the splitting off of the SDP from Labour, helped to re-elect Margaret Thatcher in 1983. I well recall a phone-in programme on Swansea Sound during that election in which a local Conservative candidate was being slaughtered by ordinary listeners disgusted at the impact of Thatcherism on the South Wales economy. At some point an enraged voter rang in to demand to know what the Tories had ever done for the working classes. The answer that they had allowed them to buy their own homes completely deflated the caller's anger and the rest of the programme was completed in relative calm, the Tory candidate having silenced most of his critics for the time being. But today, said Caroline Davey, Shelter's deputy director of policy and campaigns, millions of homes have been taken out of the social sector without being replaced and two million households languish on waiting lists, more than one million children live in overcrowded housing and tens of thousands are trapped in temporary accommodation. "Every day Shelter sees the devastating effect the shortage of affordable housing has on people, and how their lives could be vastly improved by a decent, secure home." The number of people across Britain on waiting lists for a council house is up almost 10% in the last year. The paper says that some inner-city areas will need decades to clear their backlog and that with house building all but stopped in a recession that has seen repossessions and unemployment rise, there is a crisis in Britain's homes. Some point the finger of blame at the Right to Buy. It seems to me that the biggest failing with the Right to Buy was that resources were not made available to replace the stock that was sold off. Peter King of De Montfort University, is right when he says that "the housing wasn't lost, it stayed put. Any right to buy property sold wasn't empty and available, it was already lived in." But over the last 30 years the capacity of the remaining social rented housing stock to cope with demand has been undermined by the policy, whilst the sell-offs themselves fuelled housing inflation thus preventing many from getting onto the housing ladder and leaving them dependent on renting. It is also the case that it was the desirable properties that were bought first. In rural areas that was particularly serious as it devastated the stock of available rented social housing, pushed up house prices and left families with no option but to move out of their village or town if they were to find suitable homes. As a result local authorities faced huge issues in letting what was left and in particular keeping it up to standard with a massively reduced income. The ring-fencing of housing revenue budgets meant that Councils could only use rent income to fund the repair and modernisation of their properties yet this income was being massively eaten into as their housing stock reduced due to sales. Money in the rates fund was no longer available to maintain Council housing stock. Proceeds from the right to buy were directed by the government to paying off debt and were not available to build new homes whilst changes to the housing benefit system meant that resources were diminished further as Government top-sliced millions of pounds for their own coffers. The inability to fund modernisation as a result of these policies has helped to create the circumstance now whereby across Wales there is a £3 billion backlog in the money available to bring Council homes up to the Welsh Housing Quality Standard and the only option open to most local authorities is a debt-free stock transfer to a not-for-profit housing association, not subject to the same financial restraints. England and Scotland have the same issues on a bigger scale. How we tackle the problems caused by the Right to Buy now is a moot point. The key must be to replenish the stock of affordable housing, particularly that available to rent. That is why the current policy of the Welsh Government to seek the power to suspend sales in areas of high demand is the right one. It does not take away people's rights just suspends them for good social reasons so as to ensure that their desire to buy their own home does not prevent others from being rehoused. In fact we may not even have to go that far. I personally favour restricting the right to buy on new build social housing for extensive periods of time so that the Government can get a reasonable return on its investment. New tenants would take the properties on that basis so we would not be taking away from them a right they already have. In the Observer article Graeme Brown, director of Shelter Scotland says: "The haemorrhaging of affordable housing stock without building new stock was like filling the bath with the plug pulled out." He is right. If we are to replenish the rented social housing stock in areas of high demand then we need to create some stability in the sector. In other words we need to put the plug back into the bath whilst we refill it. 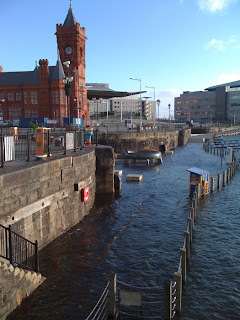 Judging from this photo posted on Twitter by Alun Preece the Cardiff Bay barrage has not been that successful in stopping flooding in that area. One could say that this is the consequence of global warming except that this sort of flooding tended to occur before the barrage was put in. Nevertheless, projections for rising sea levels do put the Assembly building as being under water within 100 to 150 years. Maybe True Wales will get their way after all. It also occurs to me that not only is the entrance to the oval basin underwater but so is access to the memorial erected by Torchwood fans to Ianto. As far as I am aware this is still in situ, well it was last time I looked. But then again why would anybody want to remove what is rapidly becoming a major tourist attraction in Wales' capital city? Avid fans of the X-files will be disappointed to learn from today's Guardian that the Ministry of Defence has closed down the hotline on which members of the public could previously report UFO sightings. "Please note it is no longer MoD policy to record, respond to, or investigate UFO sightings," it says. An MoD statement on the matter is a little more expansive. It says: "The MoD has no opinion on the existence or otherwise of extra-terrestrial life. However, in over 50 years, no UFO report has revealed any evidence of a potential threat to the United Kingdom." Nick Pope who ran the UFO project in early 1990s said the decision to scrap it was "outrageous". Speaking to the Sun, which broke the story, he said: "We're leaving ourselves wide open to terrorist attack." The last major UFO scare in Britain earlier this year involved claims that aliens had destroyed windturbines in Lincolnshire, after sightings of "massive balls of light". But then a "local blogger for a small newspaper group" revealed that her family had hosted a fireworks party in the area. Maybe Mulder and Scully should have a word with them.